Social networks are now an online retailer’s best friend, and they’re continually evolving to allow advertisers to target potential customers. Let’s take a look at three ways to optimise your ads on Facebook and Instagram. 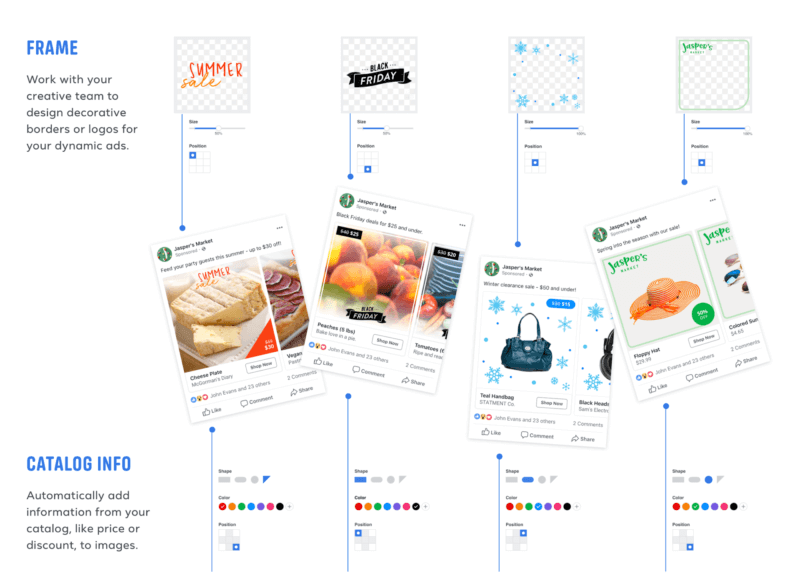 When you create a Dynamic Ad, Facebook gives you the ability to freely customise your ad by adding text and/or a visual on your product photos. Using data from your product catalogue, you can automatically superimpose stickers on your ad to give more information about the product (e.g price, price crossed out, free delivery, etc). To do this, make sure that the information in your catalogue is up to date. You can then go to “Content”, “Creative Tools”, “Customize Images” and then the “Catalogue Info” section and choose the information you want to highlight. You can then edit the shape, opacity, font, colour and position of your text. For example, if you want to create a campaign for Black Friday, you can add a discount sticker on top of your product photos. Facebook also allows advertisers to add graphic elements to their ads (logos, decorative borders, etc). For more information, visit the Facebook help centre. Facebook also gives you the opportunity to highlight several products in the same category in your dynamic ads. 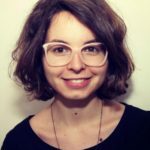 When setting up your ads, you can choose between three options for displaying your products: the category (eg lifestyle), the brand, or the type of product (eg glasses). Your product catalogue is a key part of your dynamic ads on Facebook and Instagram – it contains all the information you need to successfully sell your products on these platforms. To sell your products on Facebook, your feed must contain 9 attributes: ‘id’, ‘GTIN’ ‘availability’, ‘condition’, ‘title’, ‘description’, ‘image link’, ‘URL link’ and ‘price’. 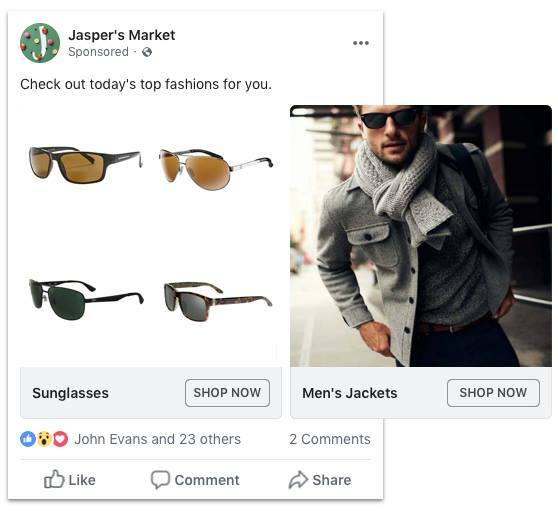 However, to improve your advertising strategy, Facebook strongly recommends using custom labels (up to 5 maximum), similar to Google Shopping Custom Labels. These allow you to segment your catalogue according to certain values relating to your products: margin rate, best sellers, percentage of discounts, product rating, promo codes, seasonality, inventory, etc. For example, if you want to highlight your bestsellers for Christmas, you can run a special campaign focusing on these products for the holiday season. The Shopping feature allows Instagram users to see the products you sell on your e-commerce site, and provides an opportunity to share news and highlight your best selling products. 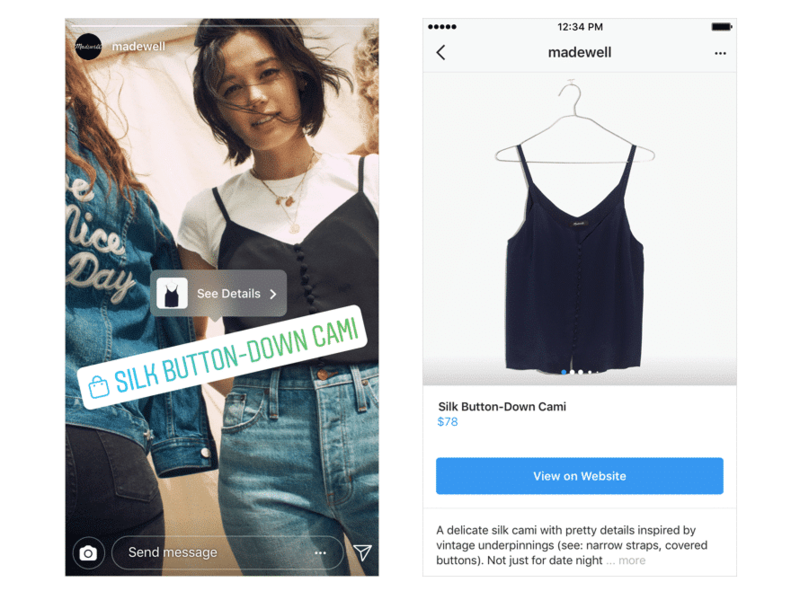 After launching the Shopping feature, Instagram later launched this feature within Stories. To date, more than 90 million people use Instagram Shopping each month. In addition, social network users can also discover your products through “Search” and “Explore”. For example, when someone watches one of your Shopping Stories, they can simply tap the bag icon to learn more about the product. They can then see the title of the product, an image, its description, its price and a link directly to your online store where they can buy your product. To enable this feature, you will need to associate your products with your Facebook catalogue. Once your catalogue is set up, you will be able to set up your posts and stories. And finally, Instagram is taking advantage of the holiday season to launch two new features: the ability to buy products directly from a video and a category dedicated to Shopping called “Collection”, allowing users to save products to buy later. Using this tool, Instagram allows brands to multiply points of contact and inspire its users. Note: for Stories, you can also create a product sticker by story. These stickers can be used in videos too.